I wouldn’t say Independence Day is my absolute favorite holiday – but it’s close to favorite. Hot summer holiday (read not cold), excuse for everyone to wear the same colors, and a day to celebrate our history and country. Oh and fireworks. I love fireworks. I’m not super crafty but I like being crafty every now and then. 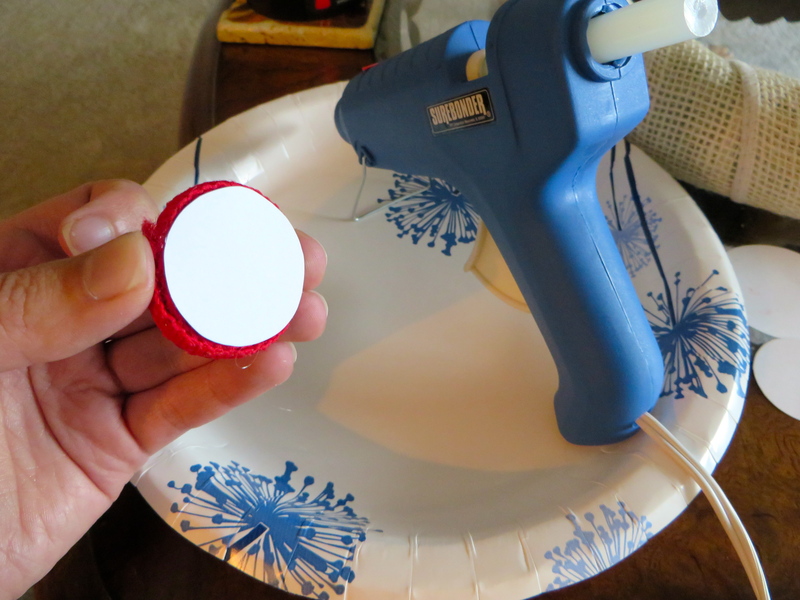 And that’s crafty in a good, Michaels-shopping kind of way. So my 30 before 30 list includes making a decor item for every holiday. 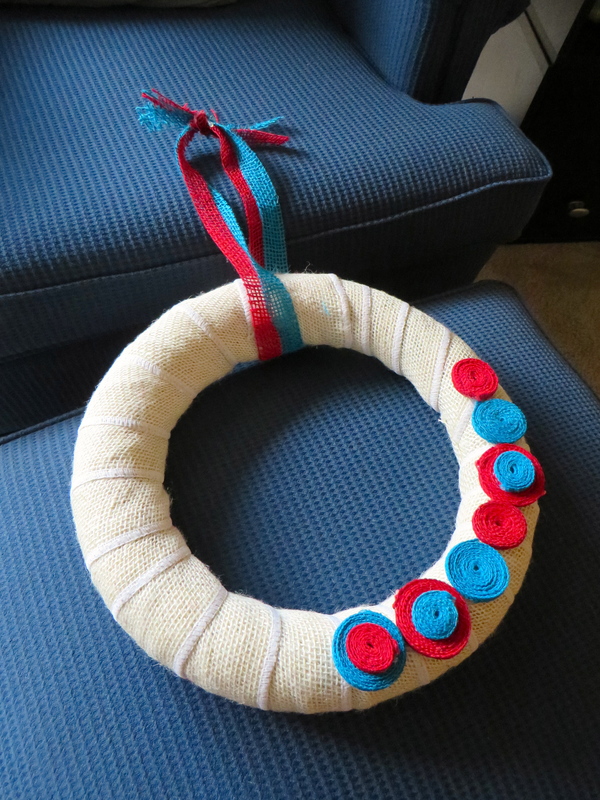 And my first one is a wreath for the 4th of July. Burlap is big right now. 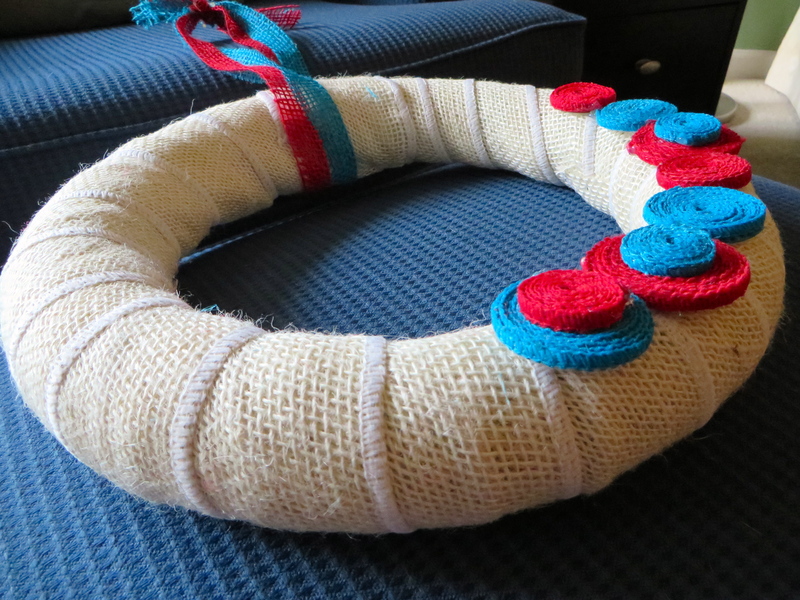 So of course I wanted to make a burlap wreath. I had seen many variations on Pinterest but I pretty much ran into Michaels and winged it. 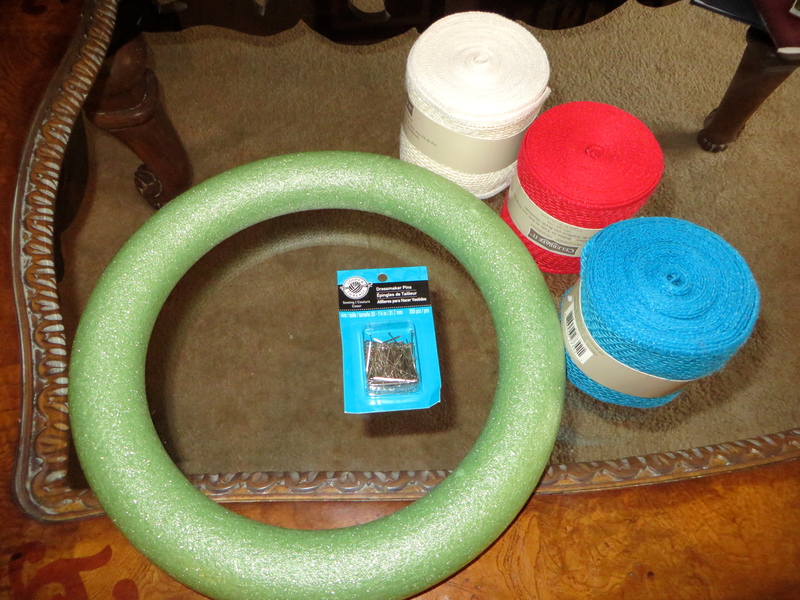 I grabbed a foam wreath, some wired burlap ribbon (red, off-white, and blue), and pins. I had an idea of how I wanted to make it but no real plan…so I just jumped in. I wrapped the whole foam wreath with the white burlap, pinning each end. A tip – the pearl pins (that I did not buy) will hold better since burlap has holes in it (duh, Katy). Also, get enough burlap to go around the wreath twice, again, since it has holes in it and you can see the green foam through the holes. Like I said, I ran into Michaels and winged it. Next, I Googled how to make burlap flowers and found a variety of flower looks and how to make them. 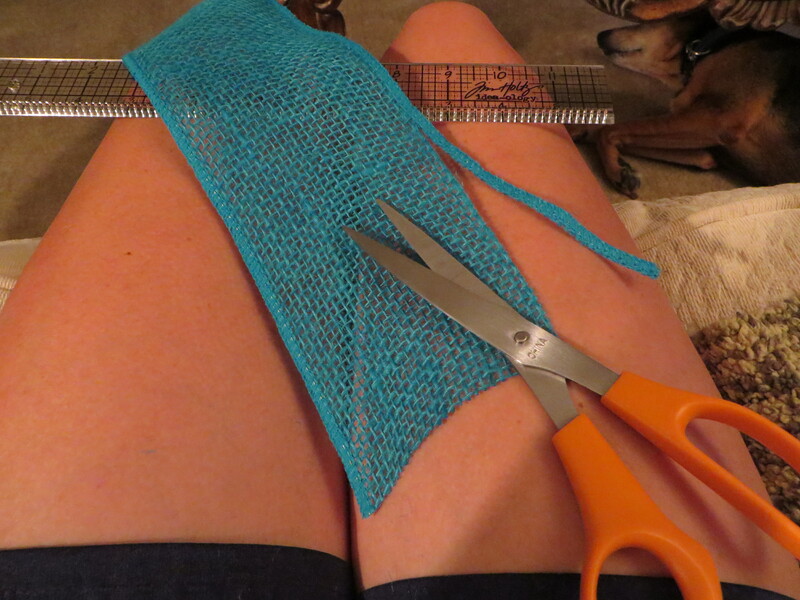 I tried and they were not turning out well….burlap does fray and this seemed to be fraying especially a lot when trying to work with it. 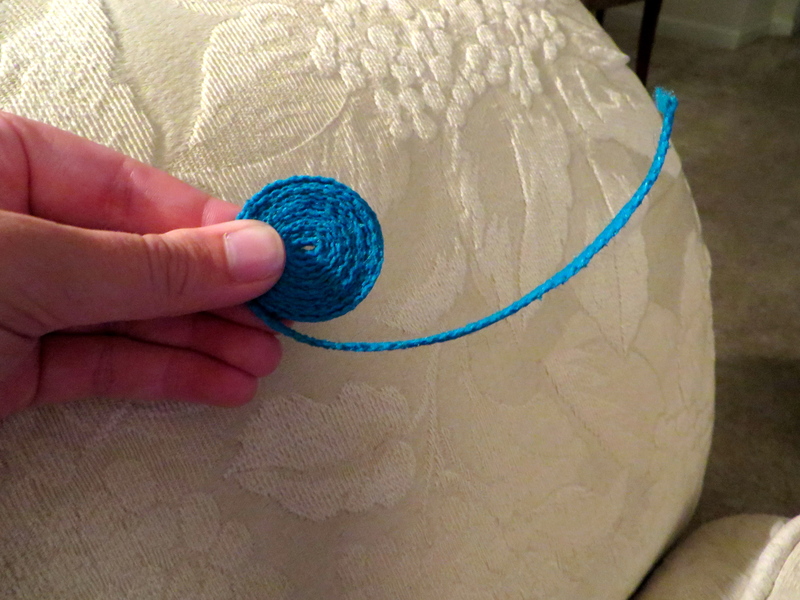 I did notice, though, that when I cut off the wire it was fairly wide, so I thought I’d try just rolling that up. It was really easy and looked kind of cute. So I did a bunch of those in red and blue in various sizes. 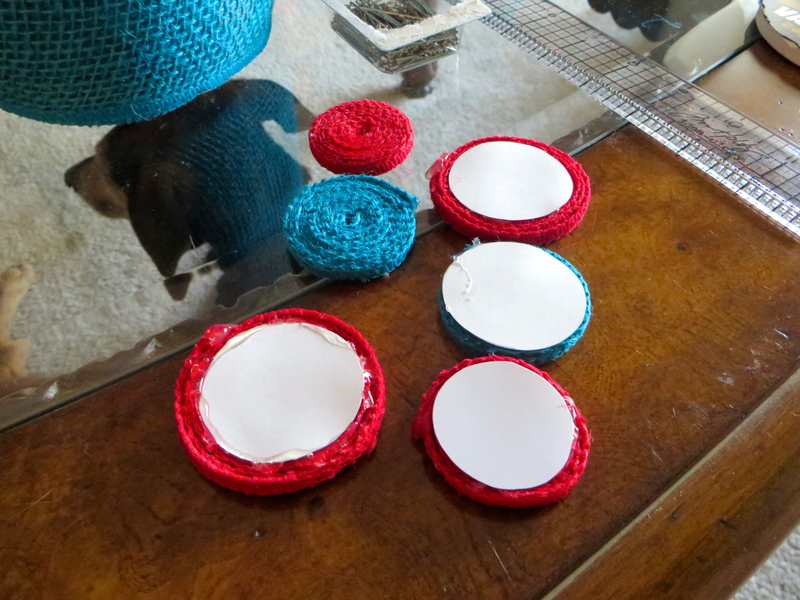 Then I cut out some cardstock in circles to glue on the back, just to make them a little more sturdy and to help attach them to the wreath. I glued some of the smaller ones onto the larger ones, then glued them all onto the wreath! 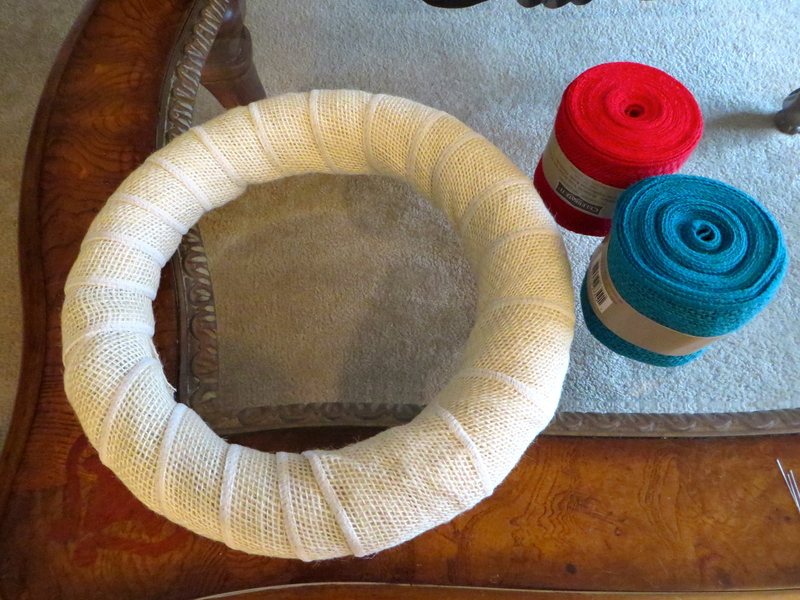 Then I cut and tied (and reinforced the knot with some glue) two burlap strips as a hanger! Not super crafty and it definitely looks homemade, but it’s festive and works for me! Now I have to get it on the door so it gets plenty of play time. I hope everyone has a great long holiday weekend next week! Categories: Wonderful Wednesday | Tags: 30 before 30, 4th of July, crafts, wreath | Permalink.